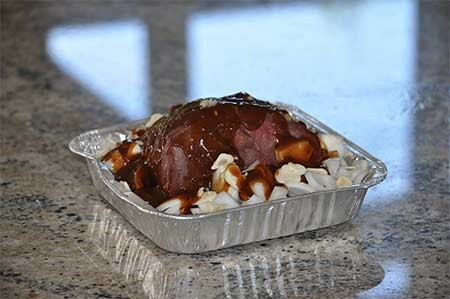 Have you ever wanted to barbeque a moose roast and still have it be tender? We have, and recently cooked a moose round roast on the barbeque that was so tender once we carved it, it was possible to cut it with your fork. How did we do it? Let me tell you about it. I started out with a moose round roast; I know this is not the best cut to be barbequing. So I knew it would require moist heat if it were to be palatable. I remembered a friend of mine telling me how he had cooked ribs on his barbeque and had great results. I wondered if I could achieve the same? The process is quite simple really, and you could likely apply this to any meat that is tough. Cook it with moisture over a long period of time. How much time… I cooked our roast for almost 9 hours. 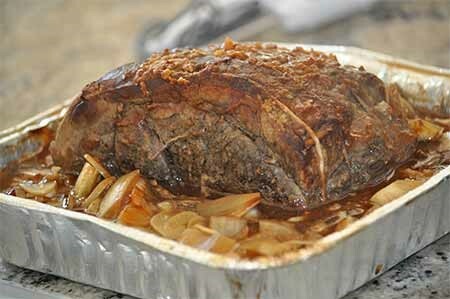 Start with a 8 inch by 8 inch roasting pan and place the moose round roast that you plan to barbeque onto a thin layer of the chopped onions. Place the rest of the onions around the roast evenly. What I did next was to sprinkle the onions with the sliced garlic and rubbed the roast itself with the minced garlic. I followed this by pouring the barbeque sauce over the roast. Once this was complete I covered the entire pan with a layer of heavy aluminum foil and took the pan (with the roast in it) outside to my barbeque. I lit one burner (in my case the right hand one) and set it to low heat. I then placed the covered pan containing the moose roast I wished to barbeque on the left hand side well away from the heating element. I then closed the lid. I have a thermometer on the outside lid of my barbeque I maintained a constant temperature of about 200 degrees Fahrenheit for 9 hours, until the internal temperature reached a minimum of 140 degrees; or your required doneness. At the end of the cooking time the barbequed moose roast was cooked to perfection. We served the moose roast with baby potatoes, carrots, chopped onions and mushrooms. All of which were cooked on the barbeque while the roast was cooking. All the veggies were wrapped in foil; salt, pepper and butter were added and placed directly over the burner that was set on low temperature. About 1 1/4 hours. We made gravy from the juice from the meat pan as well we added the onions from the meat pan to our veggie dish. Now I can say we learned how to barbeque a moose roast… and have it tender too! Do you like what you see? Join us on our Fishing Blog for more up to the minute action, tips and tactics! !